Purple Plum Fairy: Haier is Chillin’ Summer until June 30! 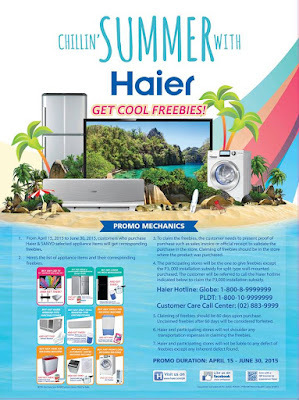 Press release: Mild drizzles and overcast skies have frequently been making appearances lately, signalling that summer is winding down; but don’t put away your sunscreen and beach hats just yet because the sun keeps shining over at Haier, with its Chillin’ Summer Promo. Make the rest of your summer count by making Haier a part of it, and let the summer fun continue!